This is not artwork, really. But, it is an icon of Our Lady of Guadalupe, and it has such a magnificent story! So, back in the day when Spain took over Mexico, the indigenous people of Mexico were, to put it mildly, not very happy with Spain. At all. Though the Spanish conquered them, they still held on to their former Aztec traditions, some traditions which included human sacrifice, to please the Aztec gods. Though the Spanish tried to forcefully convert them, they resisted. Some converted, of course! Juan Diego was a poor Mexican peasant who had converted to Catholicism. Mind you, he was only a simple peasant. But God has a way of using the simple for His own purposes! On December 9, 1531, he was walking along the Hill of Tepeyac when suddenly the Virgin Mary appeared to him. She appeared as an indigenous maiden and spoke to Juan in Nahuatl, the language that the Aztec empire spoke. She described herself as the lady “coatlaxopeuh” or, roughly translated, the lady “who crushes the serpent,” which is a reference from her appearance in Revelation. And, finally, the lady told Juan Diego that she wished a church to be built at that place in her honor. Immediately that day, Juan Diego went to the Archbishop and told him of the apparition. But the archbishop was skeptical and sent him away. After that, the Virgin Mary appeared to Juan Diego again and told him to keep insisting. So, keep on insisting he did! The next day, December 10, he visited the archbishop a second time. The archbishop asked for a sign to prove that she was who she said she was. So, once more, the Virgin Mary appeared to Juan Diego and told him to come to the hill the next day for a sign. Well. Life hit Juan Diego fast and hard then. The next day, December 11, his uncle grew very sick. So, Juan Diego ministered to his uncle and did not go back to the site, as he had promised. By, December 12, his uncle was determined to be dying, so Juan Diego went to go find a priest so that last rites could be done. However, self-conscious and ashamed that he had missed his meeting with the Virgin Mary that he had promised, he went around the hill in a different way so as to avoid her entirely. She told him that his uncle was healed and told him to gather up flowers at the top of the Hill of Tepeyac, a rocky hill that was normally barren in December. He did what she said, finding Castellian roses — Spanish flowers not normally found in Mexico. The Virgin Mary rearranged the flowers in his tilma, which is a poor peasant’s cloak. Then, off Juan Diego went to the archbishop, a day late, with the sign of the rare flowers! As he presented the flowers to the archbishop, the flowers tumbled from the tilma, and there was the famous miraculous image of Our Lady of Guadalupe on his tilma. 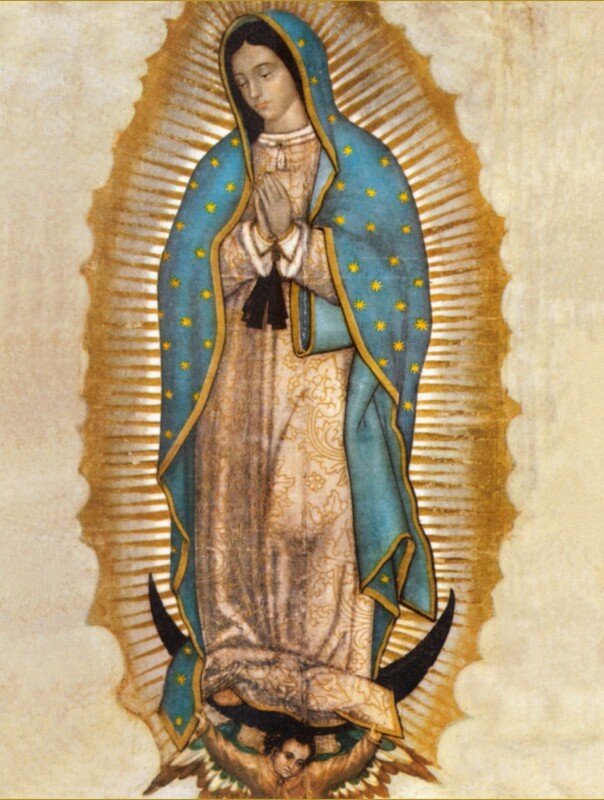 Our Lady of Guadalupe, c. 1531. Basilica of Our Lady of Guadalupe, Tepeyac Hill, Mexico City, Mexico. Look how beautiful she is! Plus, it’s amazing how long this has survived. The tilma is made out of catcus fibers and a peasant’s tilma typically only lasts 20 years, maximum. Yet, this has lasted for centuries. The devotion to Our Lady of Guadalupe (the name, Guadalupe, coming from the word “coatlaxopeuh” since it sounds remarkably similar) spread very quickly throughout Latin America. After all, the Virgin Mary appeared, not as a white woman, whom the Spaniards commonly portrayed her as, but as one of them who looked like them and spoke like them. And they loved her for it. As for Juan Diego? He’s St. Juan Diego. He was canonized on July 31, 2002 and his feast day is celebrated on December 9 — the day when he first met the Blessed Virgin Mary and followed out her orders. Our Lady of Guadalupe is known the Patroness of the Americas, so it’s likely that if you live somewhere in America, you have seen her around! Because of this, I like to use the medallion of Our Lady of Guadalupe when I make rosaries for my children… after all, they’re American! Right now, as I am writing this, there are are some pretty disturbing things going on right now in the United States, where I live. For instance, a couple of days ago, we just had a bunch of neo-Nazis march openly in Charlottesville. Yes, it’s their right to march because they are allowed free speech under our First Amendment. But the fact that there are hundreds of people who would openly align themselves with Hitler and Nazi ideology — an ideology which killed millions in death camps alone — is terrifying. That’s scary enough by itself, but there are other things going on too, of course. We have an uptick of extremists of all sorts with left, right, and foreign ideologies. There are several opposing populist movements going on, which is fracturing America. Postmodernism is leaking out of art and coming into popular culture so that “truth” has become relative and it’s hard to know what is true and what is false. Abortion is considered to be a “basic human right” instead of the destruction of another human being. The flip-flopping of immigration policies from one administration to another is causing a massive amount of uncertainty and angst for so many people. Eugenics is becoming more and more acceptable. We’re in several cold wars and several real ones. And I could continue this list for much longer! But, when haven’t things been grim? Looking at the story of St. Juan Diego, it’s easy to ignore the background context to simply see a story of extraordinary faith in a time where things were simpler. But, even in that time had its own challenges that they faced. For example, the Aztecs had just been conquered by the Spaniards. Why? Well. For one, the Spaniards brought lots of weapons over to destroy them with full intention of conquering them. For another, the Spaniards made sure to enlist the help of many enemies of the warrior Aztec civilization who were tired of being used as human sacrifices. And then there were the diseases that the Spaniards inadvertently brought with them simply wiped out a large portion of their population. All of these combined helped them conquer the Aztecs. But, just because you can conquer a country doesn’t mean it’s easy to restart that country in your own terms. As we know from our own recent excursions into other countries, even though those countries can be eventually conquered, it can be hard to take over and redirect that country. And this is especially true if that country has completely different values than the conquering country. The Aztecs, with its religion that relied heavily on human sacrifice, was completely at odds with the Spaniards’ Catholicism. The Spaniards were intent on converting these Aztecs into Catholicism from the Aztec religion, even if they had to do so by force. And they resisted the Spaniards’ efforts, which likely caused the Spaniards to be even more brutal in their evangelization than they might have otherwise been. Furthermore, colonization can cause for some enormous changes that can cause a complete paradigm shift in ways that might be hard to even grasp how much it changes the culture, economy, and life in general. The arrival of the Spaniards’ horses changed everything there. Before then, the Aztec civilization had no large animals that could haul long loads. So, they relied on a system of canals to transport things. Mexico City used to be a bunch of canals which were connected with each other. But, the Spaniards couldn’t travel that land with their horses very well. So, the Spaniards drained many of the canals and lakes that were around that impeded their horses. And this is only scratching the surface! So, things were hardly simple in those days either. Every generation has its own challenges and difficulties it faces. And honestly, sometimes it can be overwhelming. Sometimes, there are no easy solutions, and the decisions that are made in the past can have significant ramifications to our present. For example, even now, Mexico City is facing environmental concerns from the draining of their canals hundreds of years ago. So what can we do about it? Many of us have no real say, aside from our votes, about the way that things are. Sure, we can talk against things, but in a world that is increasingly becoming a giant echo chamber, what effect will that have, besides letting us virtue-signal? And that’s why it’s so important to look at the saints. First, we need to make sure that we’re listening to God, always, because He will guide us to His Truth. Next, we have to nurture and do our best to understand our faith so that we can be sure when we need to stand up and fight. There are grave sins that cry out to heaven, for example, and we need to know what these are so we can make a stand against them. And finally, we need to make sure that, no matter what we do, we are always loving God and always loving our neighbor. The world can be scary at times. Give us the strength and help us listen to You in the midst of this vale of tears. Help us stand up for You, no matter how hard it can be.